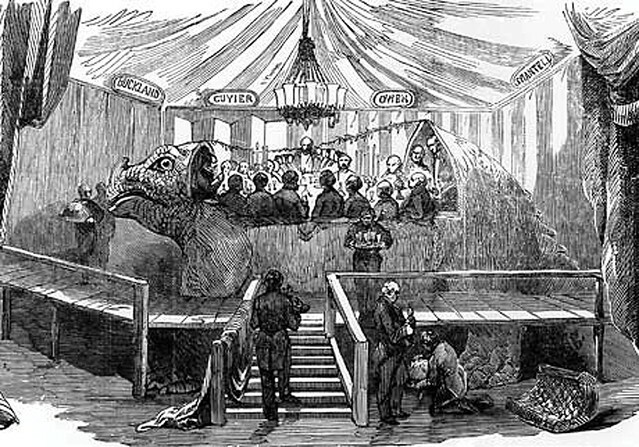 An engraving of the Iguanodon Dinner Party that appeared in The London Illustrated News, 7 January 1854. Dec. 16. Birthdate, in 1775, of Jane Austen. You know what to do. Dec. 17. Many small greenhouses pay their bills in winter by filling their empty, sunlit spaces with poinsettias, making them a virtuous purchase for those who wish to make only virtuous purchases during the holiday season. Dec. 18. We are acquainted with a young entrepreneur who runs a business based mostly on cash and an ever-changing clientele. Knowing that he may run into any number of his most favored customers during the holiday season, not to mention innumerable cousins, aunts, neighbors, friends, former school chums and past business associates with whom he may or may not have a relationship that calls for an exchange of gifts at the holidays, he secures for himself a fat roll of lottery tickets, sequesters them in an inner pocket of his coat, and presents one to anyone who appears on the verge of delivering a holiday greeting of any sort. While the tickets cost only $1 apiece, they endow the recipient with the near limitless possibility of riches and good fortune, making them an excellent gift indeed, and conveying the impression that the young man has put each recipient utmost in his thoughts. Dec. 19. A few moments of cheer should be directed toward children living in impoverished areas who, due to poor sanitation and unrelenting attacks by mosquitoes, flies and other bloodsucking insects, are infested with parasites that make their holiday season far less enjoyable than our own. Save the Children will treat 30 children with de-worming medication and vitamins the minute you send them $30. Get to it. Dec. 20. A recipe has been offered for chicken milk as follows: Boil some water and pour it in a glass with some sugar and orange flower water. Beat two eggs, the yolks only. Put this into a stewpan with the boiling water stir till it thickens, then drink hot. This is said to be very much used in France when persons suffer from a chill or require something light and nourishing. The French are capable of pulling off complicated maneuvers involving eggs in ways that the rest of us are not. We offer this last remark as a warning only. Dec. 21. New moon, 12:15 am. A total lunar eclipse will leave the town of Hanga Roa, on Easter Island, in total darkness for four minutes and 41 seconds. It is also the winter solstice, making it the longest, darkest night of the year and the official beginning of winter. Indulge in an hour of despair. Dec. 22. The sun rises today at 7:37 am and sets at 4:53 pm. One wonders why it bothers. Dec. 23. It is not too late to buy some paperwhites, tulips, hyacinths or amaryllis, pot them up, tie a bow around them, and be done with it. Any guilt over this easy and last-minute gift can be assuaged by choosing a more expensive pot; gardeners notice such things. Dec. 24. If chicken milk holds no appeal, the only thing to do is seek out good-quality eggnog, adding equal parts bourbon and dark rum in whatever quantity best meets your needs. Sprinkling cinnamon over the top makes it appear more nutritious, as if actual food had been prepared. Dec. 25. Christmas, at its best, is a lovely, quiet day in which little is expected of you. If you find that quite the opposite is true, we prescribe a long and solitary walk. Dec. 26. The pencil cactus, Euphorbia tirucalli, is far more harmful than the poinsettia, given its propensity to fling toxic sap into the eyes of anyone who attempts to trim it or move it clumsily around, yet it has nowhere near the sinister reputation of the poinsettia. Dec. 27. In the better bars of London, it is possible to strike up a conversation with the bartender about the impoverished palates of Americans who are deprived their measure of Cuban rum. British bartenders, being acquainted with the British naval history of granting every sailor his rum ration, may at some point feel obliged to pour a taste for those under his care. One would do well at this point to inquire, with some naiveté, as to the distinction between cask-aged rum and the younger variety. At this point, a bottle of 15-year, single-cask Cuban rum may be upended into one's glass, summoning all at once, on a rainy London night, the dark, sweet, forbidden flavor of cane fields and embargo, thus making everything else about the journey entirely worthwhile. Dec. 28. Now would be the time to prune a fruit tree, if only you knew how. Dec. 29. It has come to our attention that baby owls are sometimes inadvertently transported into our community by way of hay bales sold at feed stores. The owlets nest in the hay bales and don't make themselves known until the time comes to offload the shipment. Owls look startled by nature; owls that have been taken far from home and transported to a feed store warehouse look as though they may never recover from the shock. Dec. 30. Something wise and instructive should be said about the year that is coming to an end. Dec. 31. A dinner was held on this night in 1853 inside a model of an iguanadon. The host, paleontologist Benjamin Waterhouse Hawkins, served mock turtle, cod and oyster sauce, pigeon pie, pheasants, woodcock and snipes, as well as a layered jelly and fruit mold. It is no simple matter to decide what to serve inside a dinosaur.